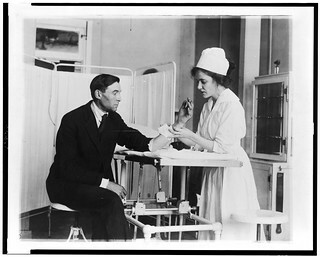 Believed to be in Public Domain From Library of Congress, Prints and Photographs Collections. More on copyright: What does "no known restrictions" mean? For information from Creative Commons on proper licensing for images believed to already be in the public domain please-- click here. By using this image from this site, you are acknowledging that you have read all the information in this description and accept responsibility for any use by you or your representatives. You are accepting responsibility for conducting any additional due diligence that may be necessary to ensure your proper use of this image. United States Public Health Service--People--1910-1930.